When Catherine Hind began studying mental health nursing she expected to find standard guidance for nurses in all settings on how to provide emotional support, especially for people who are extremely distressed, suicidal or self-harming. ‘I was surprised to find this was not the case,’ says Ms Hind, who studied at the University of Cumbria. ‘I first became aware of the issue after a scenario day at university. After speaking to a number of nursing students from fields other than mental health, I found they had little experience of supporting someone in distress. And they felt very worried and nervous about it. ‘When I went into practice I found this was also true of many qualified nurses, who feel they do not know what to say to someone in distress,’ she says. ‘This lack of confidence can lead them to ignore the issue, as they are afraid they will open a can of worms. Ms Hind decided to use her experience as a volunteer for the Samaritans – she is her local branch’s hospital outreach team leader – to help address this gap through a Student Quality Ambassador project. The project had two elements – an emotional support guide that is available online, and guidance training sessions. Both aim to dispel the myths around distress and self-harm and provide practical guidance. Encouraging: This can help the person to carry on talking. Use short words like ‘I see’ or ‘Go on’. If someone seems stuck with what they want to say it may help to use a phrase such as ‘It’s okay, just take your time’. This reassures the person they can go at their own pace. Reacting: This helps the person see you have heard what they have said. Use phrases such as ‘That sounds...’ or ‘It sounds like you’ve...’. This is a good way to show empathy. Reflecting: This involves repeating back what a person is saying. Use phrases such as ‘You say...’. This can show the person we understand their feelings and it also allows the person to hear what they have said and think about their words. Summarising: This helps to show you have been listening and are trying to understand the person’s meaning. Use phrases such as ‘So you feel...’ or ‘So you’re saying...’, to help the person to see the emotions they have experienced and appreciate their feelings. Sometimes when a person is very distressed they may struggle to talk about their feelings. Just letting them tell their story may help them to feel supported. ‘Nurses and nursing students were worried about approaching people, so the guide includes advice on how to structure a conversation and how to listen,’ explains Ms Hind (see box). It also offers advice on how to support someone during ‘difficult’ conversations, and where to go for further support. 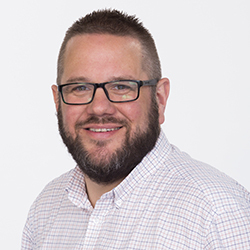 It has been downloaded hundreds of times from the University of Cumbria repository and the University Hospitals of Morecambe Bay NHS Foundation Trust (UHMB) staff intranet, as well as being used in a variety of clinical and academic settings. 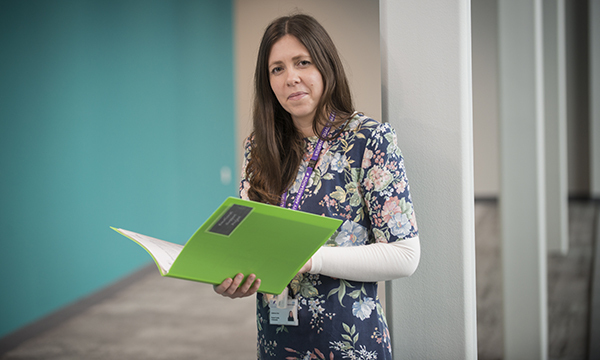 ‘In response to feedback I have made the guide more interactive by including role plays,’ says Ms Hind, a finalist in the Andrew Parker Student Nurse category at the 2018 RCNi Nurse Awards. Her programme of quarterly emotional support sessions for all staff at UHMB was fully booked last year. Participants use role play and discussion to explore distress, self-harm and suicide, and are encouraged to consider their own feelings and reactions. 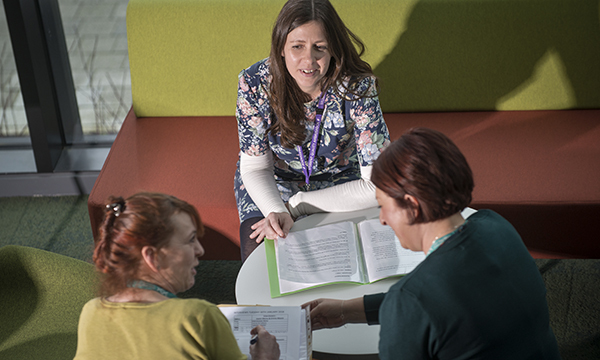 The course has also been run for midwifery preceptors and nursing students and as part of the University of Cumbria’s mental health and well-being conference in February. The sessions only have capacity for 20 participants because of the emotional content, and colleagues have welcomed the opportunity to discuss their own distress. ‘At the guidance sessions we explain to people that if things are difficult for them we can talk to them at the end of the session. We have the room for an extra hour so people can come and speak to us, which a few have done. In the emergency department, her Samaritans hospital outreach role has resulted in a pilot partnership between the charity and the trust. ‘The partnership aims to provide staff and patients with information and raise awareness about Samaritans, with the intention of offering support specifically to people who are self-harming and/or have suicidal thoughts or intentions,’ says Ms Hind. Posters with the Samaritans’ phone number are displayed throughout the trust, and a leaflet with details about the charity locally is now part of the emergency department discharge package. For people who may initially be hesitant to call the Samaritans, the resource suggests self-help techniques. ‘The outreach project was able to bring everyone together to ensure people have a better experience, and is helpful for those who are coming to A&E and struggling with their emotional health,’ says Ms Hind. ‘As well as the leaflet, the project offers staff training to develop a higher level of emotional understanding and ways to take appropriate action when faced with an emotionally distressed patient. Ms Hind worked on the project with Jenny Dighton, then director of Lancaster and District branch of Samaritans and now in a training role for the charity. ‘Catherine was instrumental in us establishing our informal relationship with Lancaster Royal Infirmary to produce the leaflet,’ says Ms Dighton. Ms Hind has been approached by other organisations keen to use the guide. Meanwhile, the sessions were incorporated into the University of Cumbria nursing degree for the 2017-18 academic year, and she is organising her next training sessions at UHMB. Now qualified, Ms Hind is enjoying her first Band 5 post working in Cumbria Partnership NHS Foundation Trust’s child and adolescent mental health services team, and is proud of her work on the project. She says feedback suggests it is the gentleness of the approach that people like. ‘It is not assessment, rather the emphasis is on human contact and exploring feelings. ‘The project is also unique in that it allows clinicians to discuss their own concerns about approaching people in distress, and how any anxiety may affect their ability to care for others.